As American television’s sharpest comedy of the ’90s, The Simpsons understandably bears the marks of the decade that surrounded its most popular and celebrated run. “Simpson Tide” reflects its time more strikingly than most. The references come quickly: Crimson Tide, Don’t Ask Don’t Tell, the Clapper, the Bartman, Cindy Crawford, Starbucks, David Schwimmer, the Tailhook scandal, Rodney King, and an indirect reference to the era’s lack of U.S. military entanglements. On a commentary track notable for its long stretches of silence, executive producers Al Jean and Mike Reiss mention that, at the time of this episode, they’d worked on four episodes together. The other three had more sentimentality—they don’t name the other three episodes specifically, and IMDB offers little insight—and “Simpson Tide” was more of a silly lark. But people liked and remembered “Simpson Tide” more than the others. That could be because, as Reiss notes, “This episode gets off to the races really fast.” It starts with a great couch gag inspired by the interstitials to Rocky And Bullwinkle, then opens with a dream sequence of Homer standing trial for eating half the population of the Planet Of Donuts. 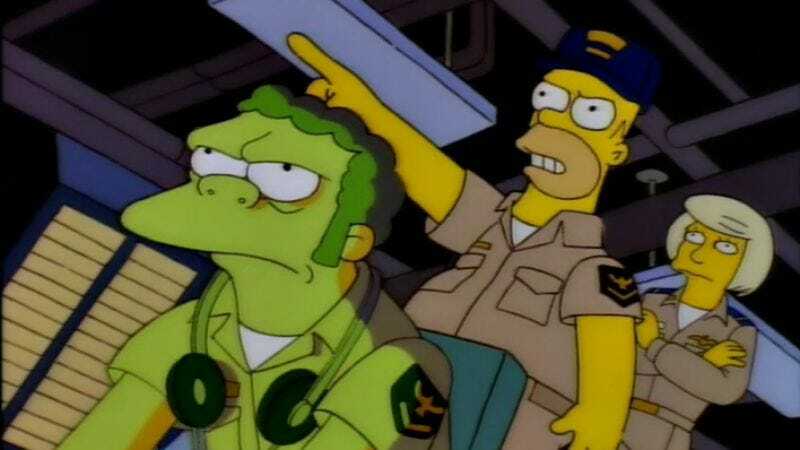 Segue to Homer’s hilariously stupid idea for a mutant donut costing him his job, then his signing up for the U.S. Naval Reserve (“America’s 17th line of defense, between the Mississippi National Guard and the League Of Women Voters”)—all within a few short minutes. If you really want to reach, you could say “Simpson Tide” predicts modern drone warfare when Homer tries to assuage Marge’s anxiety that he could end up in battle: “We live in a highly technological age, where fighting a war is as simple as turning off a light.” (Then he claps to turn off his lamp, though they don’t have a Clapper.) While we’re reaching for prescience, you could also say the episode predicts the resurgence of a hostile Russia, when the nation reverts to the Soviet Union military state after Homer steers his submarine into Russian waters. That’s jumping ahead in the episode. Going back to what Jean said about the army as a classic comedy trope, he also mentions its pitfall: What happens after basic training? Every film or TV episode that has gone down that road struggles with the next part. In the case of “Simpson Tide,” it puts Homer in a submarine for a war-games exercise that, naturally, escalates into an international incident. If only Frank Grimes could observe Homer bumbling his way to commanding a nuclear submarine, he’d rage himself to death all over again. Although Homer’s submarine—the U.S.S. Jebediah—veers into Russian waters, the Russkies strangely aren’t a factor when the hapless sub captain finally surfaces his vessel. Surrounding him are hostile ships from the U.S., Spain, China, some viking land, and an Antarctic ship manned by penguins who understand quacks. Homer’s explanation of “It’s my first day” nicely ties the episode up with a callback to his donut fiasco. That’s partly why “Simpson Tide” earns its spot as part of the classic Simpsons era. While it’s strange to think of an episode where Homer loses his job, becomes a submarine captain, and causes an international incident as “tightly written,” it is. The Simpsons excels when it meanders, too, but Sternin and Ventimilia wrote an efficient joke machine of an episode that delivers plenty of laughs with a clean, circular episode structure. 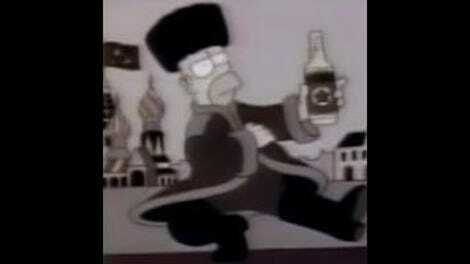 You could probably argue it’s a little too neat in that way, but when there’s a picture of Homer in an ushanka doing a Russian kalinka dance, and Lisa says, “I told him that photo would come back to haunt him,” who’s going to complain? Rod Steiger, who voiced Captain Tenille (look it up, kids! ), actually did get stuck in a torpedo tube when he was in the Navy, according to Al Jean. They didn’t get the story from him; it was just a coincidence. Performers at the USO Tour: Bob Hope, Cindy Crawford. The Naval Reserve Tour: Bob Denver, Cindy Williams. Reiss on the shot of Homer walking out of his hearing at the end of “Simpson Tide”: “Geez, every shot is stolen from Crimson Tide.” The episode idea predates the film, but the movie came out during the episode’s gestational period. Steiger’s character is based on Gene Hackman’s in the film. Next week: Homer, Smithers, and Mr. Burns flee to Cuba, where shredded meat is on every street corner, in “The Trouble With Trillions.” ¡Es carne de burro!